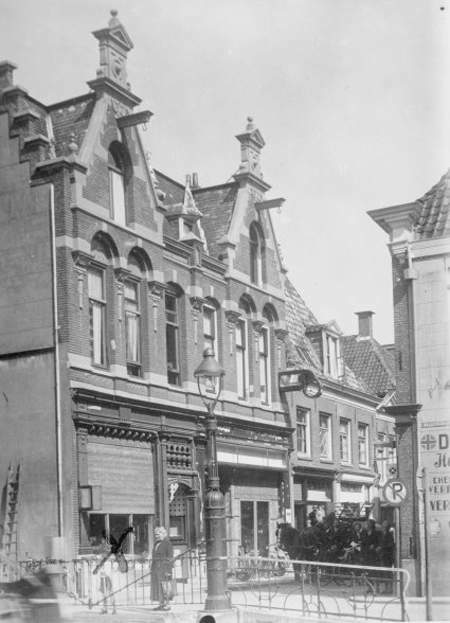 At number 42a on the 2nd Hoofdstraat was the upstairs flat of teacher Hendrina van de Rhoer, the younger sister of Joël and Levie, and her husband. Like them she was born in Staphorst, on the 29th of July in 1884, as the daughter of Jacob van de Rhoer and Vogeltje Levi. Hendrina married cattle trader Izaak Wolf, brother of Abraham Wolf, who had a textile business on Woldstraat. Izaak was born in Oss on the 19th of September 1889. Hendrina van de Rhoer (her family called her Rinie) was a teacher at the Vledderschool. In 1940 her gross salary was fl 146,84 per month. In her spare time she did voluntary work for the Red Cross. It was there that she experienced very forcefully the beginning of the Second World War. In April 1940, she had to set up an emergency hospital together with other voluntary workers in Steenwijk. At the beginning of May they saw the first German soldiers arrive; mostly young guys of 17 and 18. The following days more soldiers followed, including a large group of officers. Hendrina (Rinie) Wolf was so frightened, she did not dare to show her face. In those days the Germans would still laugh at ‘the Jews’, but later that would change. Izaak and Hendrina Wolf-van de Rhoer. As appears from article 4 of Regulation 189/40 that H. Wolf-v.d. Rhoer, born on the 29th of July 1884, a teacher, is of Jewish blood, and therefore comes under the persons meant in the Instruction of the Rijkscommissaris (State Commissioner), I have written to inform the person concerned that she is discharged from her position as of today. The undersigned has the honour to declare that she has not taken any employment for which she is paid. One month later she received, again through the intervention of Meppel local council a clear warning from the Department of Education, Science and the Protection of Culture to refrain from giving private tuition. If not, disciplinary action would be taken. She was suddenly unemployed. Later she worked for a short time, when the Jewish children were removed from regular schools and were sent to a Jewish primary school. It was obvious that Hendrina was appointed as a teacher at that school. Hereby I inform you, that both the Central Commission for Jewish education and Meppel local council agree that under your chairmanship a so-called contact commission can be established, which supervises and serves the interests of education at the primary school and the comprehensive class attached to it, principal Mrs Wolf- van de Rhoer. In the meantime it was the 6th of February 1942, so Mrs Wolf will not have been teaching here for a long period. On the 3rd of October she was taken from her house, after her husband had been taken to the labour camp in Orvelte on the 20th of July. That night Hendrina wrote a moving letter to her neighbours. This is a part of the letter which Hendrina Wolf wrote at the station in Meppel, after she had been seized in the night of 3rd of October 1942. Here a parting word from me. You all must have heard what has happened to us. In the hope I will see my loving husband again, I try to keep my spirits up. At twelve o’clock they took me out of my bed and put me in the waiting room. First we go to Westerbork and then?? Give my regards to all my neighbours, especially to Jos van de Belt. Hopefully we will see each other again and we will leave it to Him who watches over us. Bye, bye folks. Thanks for your friendship. They both saw each other for a short time in Westerbork. From there, a month later, on the 2nd of November 1942, they were deported to Auschwitz, where they were gassed on the 5th of November.